my birthday present from adobe, a photo by hep on Flickr. today a lot of things happened and i will post about them later. 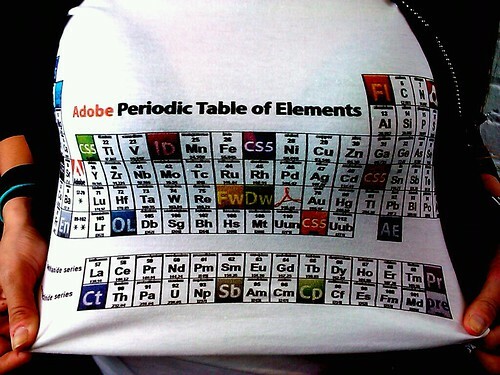 but my boss made me this adobe periodic table shirt and it is pretty badass. (sry for the crappy phone pic but it's all i've got) also this pic of me and yura is too cute for words. thx t12! Made me smile. Happy birthday hep! Also, you and Yuri are too stinking cute together. that shirt is all sorts of awesome. happy (belated) birthday hep! I hope you have another fabulous (and no more finger and hand slicing!) year! That is one awesome t-shirt!